We are now in June. This means my October's Month Long Horror/Halloween Marathon is only a few months away. Every year I abstain from horror for a good month or two to prepare myself for such a long horror marathon. I will probably not watch any horror in July, August or September this year. So I figured I would fit some in this month while I can. I will be doing the rating system a little different for this marathon. Yes you will see my rating for the movie... but you will also see an added rating of 1-5 of gore in the movie. Most of you here have seen my list of horror in the Other Thread... feel free to request a review. As long as it is a gory movie I will do my best to get to it this weekend. Day of the Dead! It has one moment in particular that I find to be the epitome of apocalyptic gore. In 1986, critically acclaimed and celebrated horror author Clive Barker directed his first feature film which has since become a modern horror classic. Clive Barker's Hellraiser intorduced some of the most frightening and sophisticated images of horror to ever grace the silver screen. No film has ever gripped the imagination so shockingly nor presented such nightmarish characters, deeds, monsters, and ideas which go so far beyond the realm of horror filmmaking and fiction. From beyond the Outer Darkness. From the nightmarish realm of the imagination. From the mind of the horror master extraordinaire, Clive Barker, comes Hellraiser — there are no limits. I thought I would start off my Gore-Fest weekend with one I have not watched in a very long time. The first time I saw this movie I was a teenager... maybe 16 or 17... and this could have been my first taste of a truly gory movie. One thing I like about this movie is it is not just gore for the sake of gore. The gore is actually vital to the storyline. I also liked how the characters in this movie was done. I liked the characters that were supposed to be liked... and I enjoyed disliking the characters that were not meant to be liked. Over-all an enjoyable movie with good effects. Even though by today's standards the gore isn't as plentiful as some of the current movies out there (not that there wasn't enough gore)... What is there is used well. THE EVIL DEAD is now more grueling than ever, featuring newly restored state-of-the-art digitally remastered picture and sound, and loaded with incredible new extras, all personally supervised by director Sam Raimi. This edition comes packaged in a replica of the original Book Of The Dead designed by Tom Sullivan. It features a sculpted 'fleshy' cover and pages of artwork produced exclusively for this edition. Also includes a special 24-Page "Bringing The Dead Home For Dinner" collector's booklet. This is another movie I always liked. It is good for both it's gory horror and to a lesser extent it's comedic presence (Comedy much more prevalent in the sequels). While I did like all three of the Evil Dead movies... this first one remains my favorite of the bunch. The majority of the gore on this movie is more in an unrealistic fun way then anything else. But for what it is... it makes for an enjoyable viewing experience. Until watching this movie today... I completely forgot it wasn't until part 2 that Ash lost his hand. For some strange reason I was thinking that happened in this movie. That is because Hellraiser was a mistake... I originally thought I put 4 drops of blood on Hellraiser. Fixing it now. I wonder if we will see 5 in the marathon. Whatever it is, unless I own it (like Dead Alive) will go on wish list instantly. An example of a 5 drops of blood to me (from my measly experience with gory movies ) would be like some of the episodes of Masters of Horror... Pelts come to mind. Another good exemple is Bloodsucking Freaks (I hope to see it in your marathon ) or the first entry in the Guinea Pig franchise (Flower of flesh and blood). well since I don't have the second one you mentioned I may have to do my best to get through Bloodsucking Freaks at some point this weekend. The "walking dead" have taken over the world. Only a small band of scientists and soldiers are definitely known to remain, and they have taken refuge in an underground missile silo. The only hope for survival of the human race hinges on discovering a way to either control the walking dead or get them back into their graves for good. Grotesque research experiments are being conducted by Dr. Logan, a borderline mad scientist, appropriately nicknamed Dr. Frankenstein by his associates. His most promising prospect for controlling the hordes of walking dead is one "guinea pig" zombie who seems to have a trace of humanity left in him. But the military leader soon discovers that some of his soldiers have been used as substitute guinea pigs in zombie experiments, and he retaliates by locking up the remaining scientific team with the zombies. I always liked the Romero zombie movies. And this is one of my favorites. The gore is really up there in this movie. 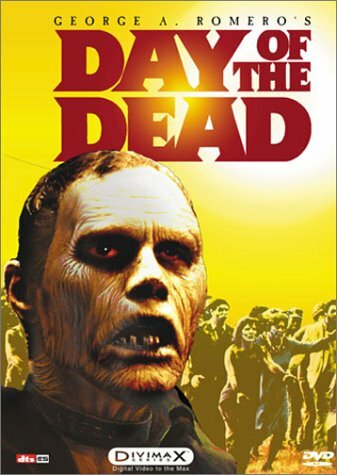 Between the zombies tearing and and eating flesh and some of the scenes such as the doctor's experiments on the zombies and a dream sequence here and there the gore is plentiful and well done. I will say that there is some characters I dislike in this movie. But I think that is usually true of most movies. I would also say that some of the acting is a bit over the top. But if you can get past that you are in for a gory walking dead treat. the zombies have taken over the facility; the camera pans slowly across a scene of them just ambling about, knee deep in gore, dragging entrails around! Brilliant. I am not sure how well I will do on this weekend's marathon. It is a favorite genre of mine... and I just can't seem to get motivated to watch the movies for some reason. No I am not giving up on the marathon... not at this point... I really would like to watch at least a few more movies for it. It is just that it seems like my heart is just not in it this weekend for some reason. Maybe I will let the Masters of Horror count in this marathon. It is a TV Series... yes... but it is done as a different short movie each week. But then the question would have to be do I count them in the movie count thread of the TV Ep count thread. hmmmmmm. Not sure what I want to do yet.